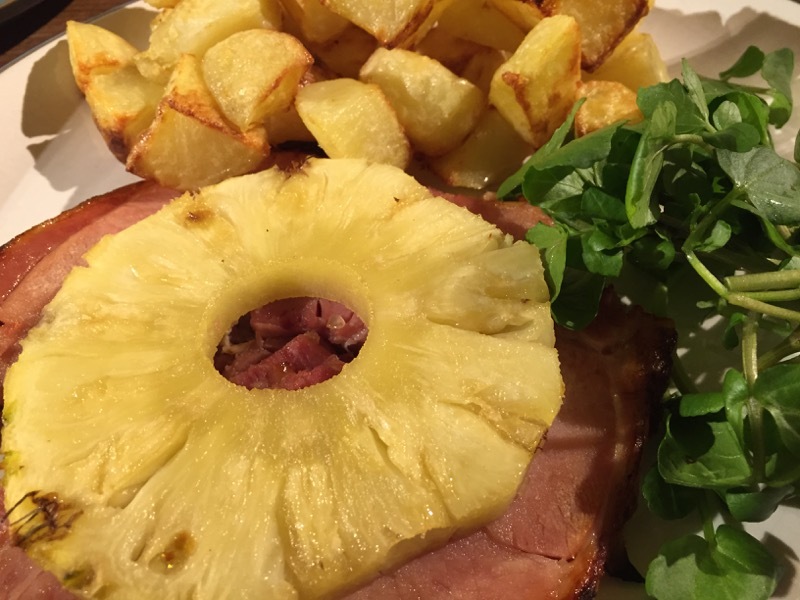 Gammon and Pineapple is one of those great classic combinations that I almost never eat. Why? Well, it all comes down to the fact that I’m not really a big fan of hot fruit. Fruit should be sweet, juicy and delicious. As soon as you heat it up, it brings out all those tart, astringent flavours, and I’m afraid that doesn’t really do it for me. Personally, I’d normally choose to have my gammon with a fried egg rather than a pineapple ring, but that’s not the recipe in the book. Gammon and Pineapple it is then. It all started when I received an email last week from Riverford saying that they had “beautifully sweet and juicy” pineapples available. OK, I was sold. I added one to my next veg box order. I also added a chunk of gammon to the next Ocado order. The pineapple arrived and it looked delicious. The gammon arrived and looked rather puny. It also had had the skin removed and had very little fat remaining on the outside. That was sad. Ah well, it’s all I had, it would have to do. The recipe starts with cooking the gammon. 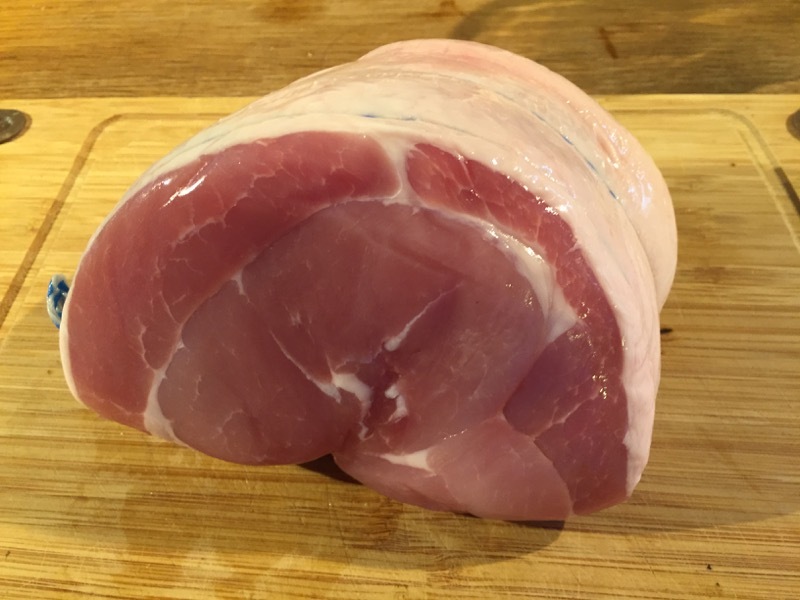 I place it in a pan of cold water, bring to the boil, then lift out the gammon, rinse under the tap and discard the water. I can see why we do this initial step – a huge amout of white scum is produced. 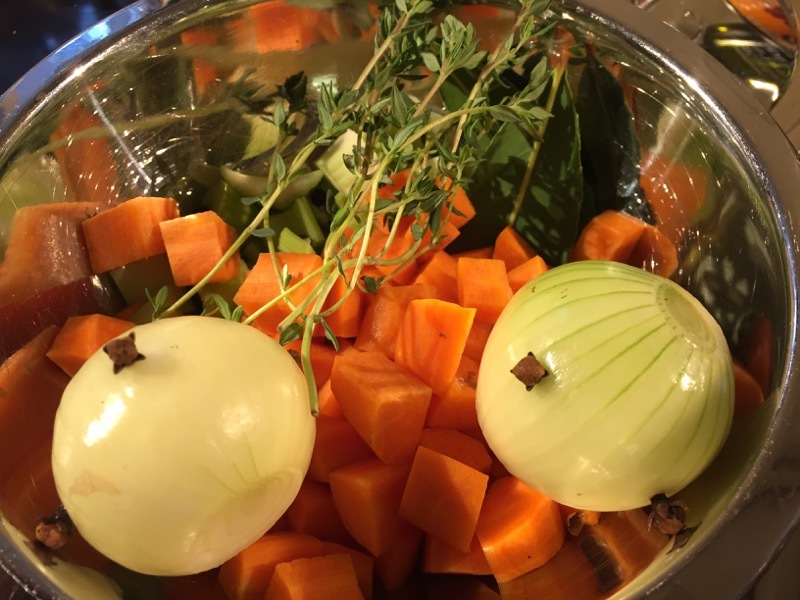 Next, I cover the gammon with cold water again and add chopped carrots, onions and celery, together with some bay leaves, thyme and black peppercorns. Back to the boil and simmer for an hour and a half. I lifted the gammon out and let it cool. Now heat up the grill. 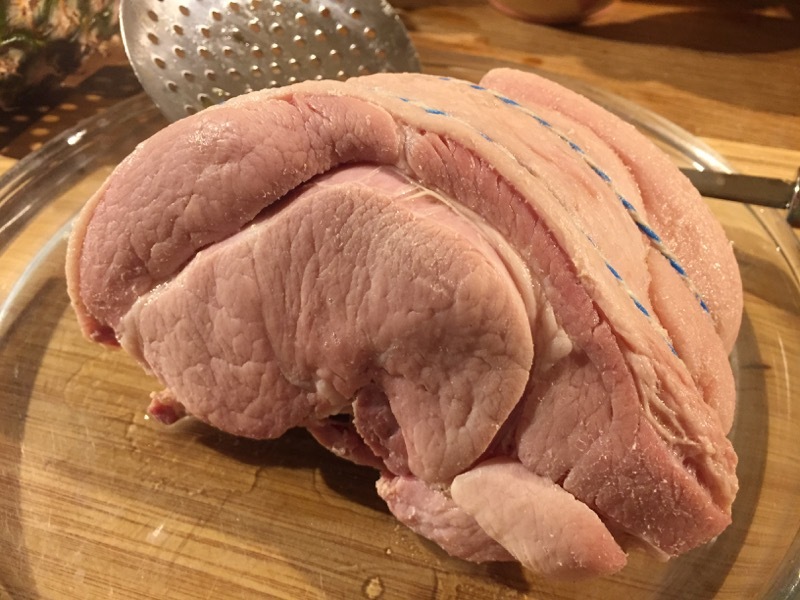 I slice the gammon, and at this point, I’m supposed to snip the edges of the gammon, through the skin and fat, to stop them curling up. There’s no skin and virtually no fat – there’s no point. I skip that step. 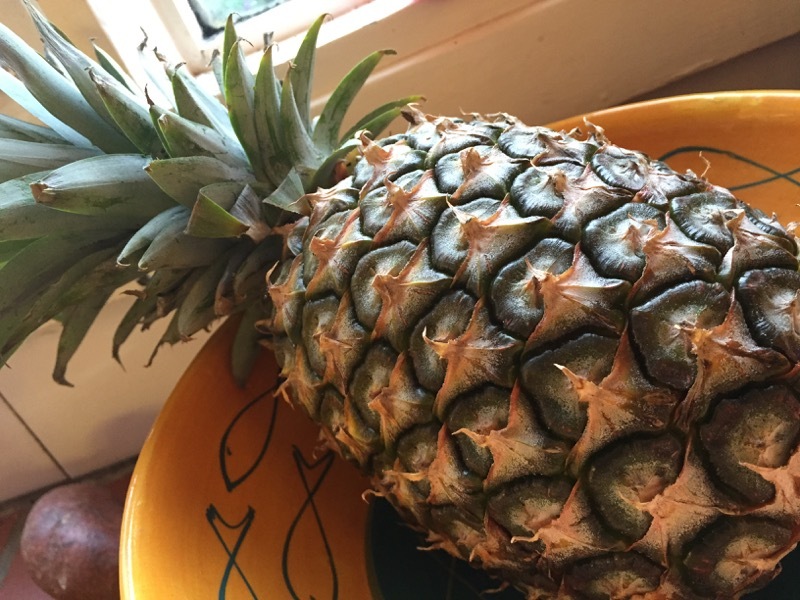 Then the pinapple – I cut it into slices and remove the core. 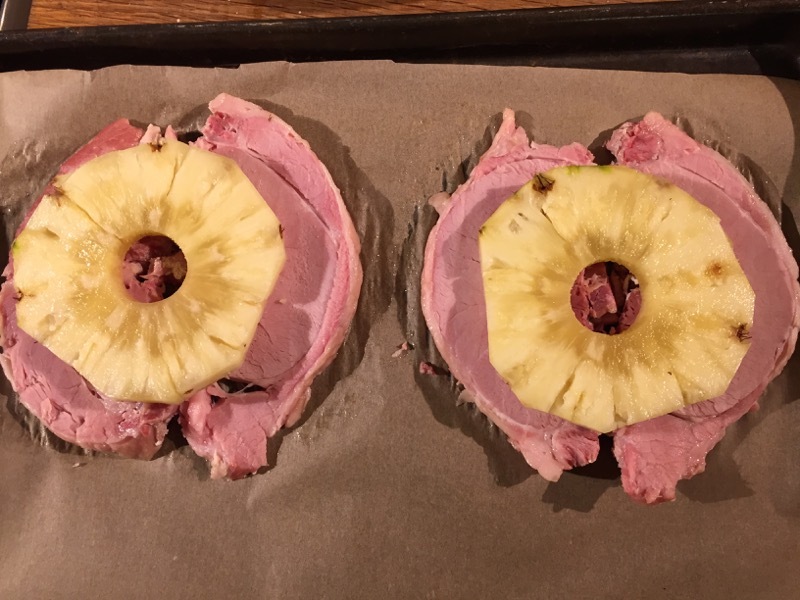 I’m supposed to snip the edges of the pineapply in the same way as the gammon, but having skipped that step on the gammon, I completely forget to do that to the pineapple. 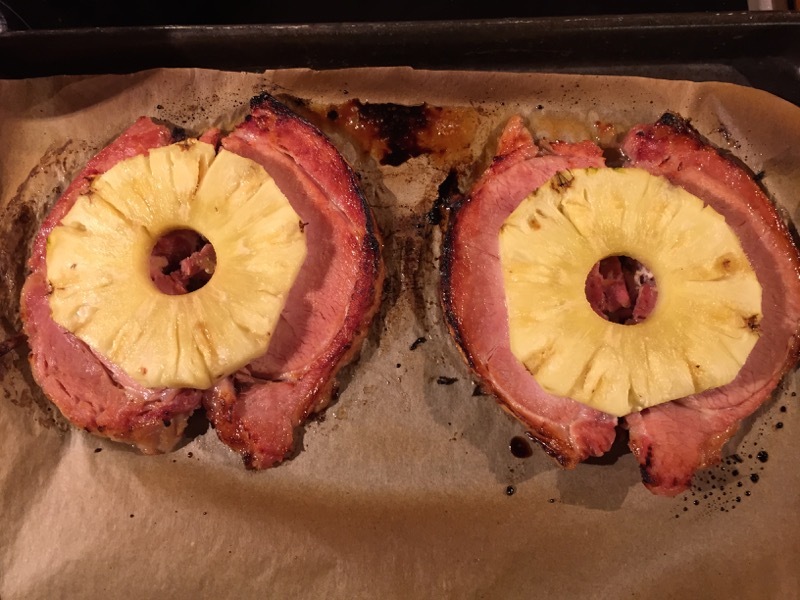 It’s clear that my Gammon and Pineapple is going to look nothing like the photo in the book. Finally, generously brush the pineaple with maple syrup, and then place everything under the grill (for my American audience, that’s what you folk call the broiler). Leave until nicely hot and slightly browned. I served with some roast potatoes and watercress, with a little freshly made English mustard on the side. The picture in the book looks very appealing, mine rather less so. But despite its looks, it tasted superb. I had been sceptical, but the sweet pineapple, with only a very slight hint of tartness, went perfectly with the delicate flavour of the gammon. I’m a convert. I will eat this one again. Wow! I’m enjoying this culinary adventure at the moment. Fish pie was last and I loved it. Then tonight I came home to another old favourite of mine that Dave and I hardly ever have. When I say “old favourite” I used to cook this a lot before I lived with Dave. But I did it the easy way, buy 2 gammon steaks and a tin of pineapple. I liked it well enough. But Dave has gone the whole hog (excuse the pun) and cooked his own gammon ham first, then cooked the gammon steak and of course his pineapple is fresh. The house was perfumed with clove and herbs when I opened the door. Very nice to come home to. So, gammon and pineapple. The gammon was so tasty. Soft and sweet and full of flavour. The pineapple was also soft and sweet, not at all acidic. The two set each other off beautifully. I was dubious about having English mustard with it because of how gently sweet the meat was. But once I tried it I stuck with it. I love that feeling that English mustard gives me, that fire in the upper nose that makes me think my head is about to explode! And so having a blast of that on the back of the delicious flavours was really nice. The watercress garnish was just a bit of green on the plate. Take it or leave it. I like watercress but it wasn’t needed with this meal other than as some colour and a little fibre! I would love to eat this meal again. I’m sorry, my scoring is getting boring. Grill didn’t need translating, but gammon did. I’d call that a ham. In particular, a cured ham. Ah, I didn’t think about that one!